Welcome to the All Saints Writtle Bell Ringers website. Thank you for visiting and we hope you enjoy browsing through the information that you find here. We have tried to make the site as informative as possible for all visitors. As well as ringing information there are items which will hopefully interest you if you are not a bellringer or just a visitor to the village. Writtle bells are a modern ring of ten bells (31cwt) cast by Taylors of Loughborough and installed in a new frame by Eayre & Smith in 2004. We also have two trebles to provide an additional light 10cwt ring of 8. In 2009 a sound lantern and variable sound control were installed. 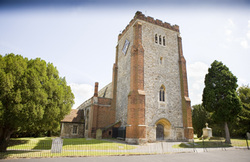 All Saints is located 2 miles west of Chelmsford and is in the South Eastern District of the Essex Association of Change Ringers. Visitors ringers are always welcome on practice nights or for Sunday service ringing. If you would like to take up the fascinating hobby of church bell ringing, either here or elsewhere, please check out the become a tower bell ringer page. Please feel free to send us feedback, comments, questions or requests to visit. We have 10 bells which were installed in 2004 with the tenor weighing 31cwt - 2qtr - 12lb (3540lb or 1606kg) in D (582.0Hz). We also have two trebles to provide an additional light ring of 8. Access to the Ringing Chamber is via a spiral staircase inside the church. OS Grid Reference: TL677061. At Writtle we have two or three or two methods to concentrate on during practices over a period of two months. Sometimes the methods are new to many members of the band; at other times we revisit past methods of the month.